A big question facing the Labour Party in a post-Blair, post-Brexit era under Jeremy Corbyn has been one of modernisation. How do they continue representing the deeply embedded traditional values of their industrial heartlands while remaining forward-thinking and electorally viable? Fuelling the fire for this conflict are wider issues of belonging, gender parity and class – all of which are examined considerately, and supplemented with good dollops of humour, by Sheffield-born writer Chris Bush in Steel. It follows the fortunes of two party members, Vanessa and Josie (Rebecca Scroggs), the former running for metro mayor of Sheffield in 2018 and the latter standing for the council in 1988. The play seamlessly flits between the two storylines, each shift in context heralded by ghostly, female-led reimaginings of Arctic Monkeys and Human League tracks. Although born up north, Vanessa moved to London for education and career prospects, which helped to cultivate a political outlook often at odds with the hard-left sentiment espoused by many of the local party members. This, combined with being a woman of colour and having a penchant for the odd soya latte, arouses suspicion and eventually all-out revolt amongst the more traditionalist, overwhelmingly male sector of the party. Ian, a battle-hardened election officer (Nigel Betts), is faced with toning down any signifiers of liberal elitism and ensuring that she falls in line with what history demands from Labour representatives in a city built on socialist values. Back in the late-eighties and steelwork engineer Josie has been persuaded by councillor Dai (also Betts) – a similarly dominant male figure to Ian – to stand for election, telling her of his desire to change the “pale, male and stale” culture of the party. As the play progresses, the spirited Josie is required to face up to a number of prejudices and the mentor-style relationship forged with Dai reveals a sinister undertone. Unsurprisingly, the steel industry itself serves as an important reference point throughout. Each character has a differing view and the contextual weight of the city’s industrial history hangs over proceedings. “It’s a trade, it’s an identity,” Ian pleads against Vanessa’s rationalisations and focus on changing the record; whereas Dai sees the dying steel industry as an “something of an albatross” until Josie, whose working experience has given her the empathy to see the people behind the figures, explains ways in which things could be improved. Frequently switching between two characters and taking on entirely different accents, personalities and mannerisms in the process is no mean feat, but Betts and Scroogs are faultless throughout. Rousing speeches and caustic quips that wouldn’t feel out of place in an episode of The Thick of It are particular highlights, while an electrifying cards on the table showdown between the old and new guard manages to be both hilarious and a worryingly accurate representation of today’s generational divide. And that’s just it: the strength of this production lies in its contemporary relevance. 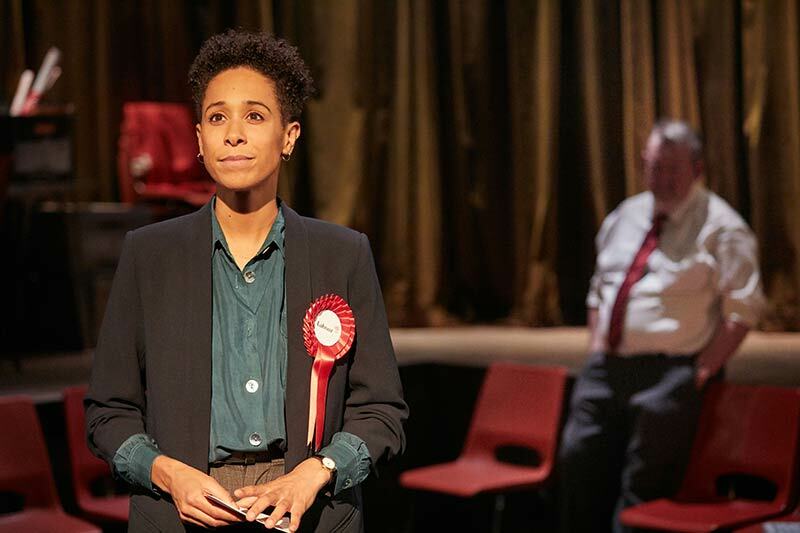 Hopefully you’ll leave questioning the role of women in politics today, the damaging effects of political dogma and, on a more local level, how Sheffield can progress as a major city while remaining true to its roots – all tied together neatly by a superb script and commanding performances.